May 03, 2018 - This young male lion stopped a caravan of cars in Kruger National Park, South Africa. It was 5 a.m. and the pride was just waking up and stretching their legs. A group of six lions was crossing the road when one decided to stop and investigate the car. 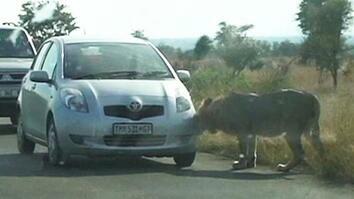 The owner of the vehicle said that a few days prior, lions had been rubbing up against the car. The scent of those lions may have been what attracted this young male. The lion's curiosity startled the visitors in the car. Thankfully nobody panicked and both the lions and people all went safely on their way! It was 5 a.m. and the pride was just waking up and stretching their legs. A group of six lions was crossing the road when one decided to stop and investigate the car. 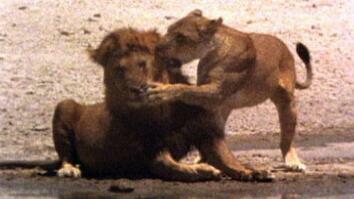 The owner of the vehicle said that a few days prior, lions had been rubbing up against the car. The scent of those lions may have been what attracted this young male. The lion's curiosity startled the visitors in the car. 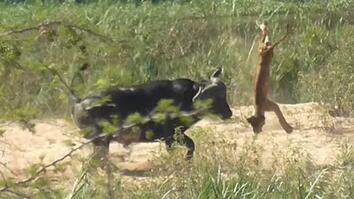 Thankfully nobody panicked and both the lions and people all went safely on their way!